For the album, see Brown Rice (album). Brown rice is whole grain rice, with the inedible outer hull removed; white rice is the same grain with the hull, bran layer and cereal germ removed. Red rice, gold rice, black rice and purple rice are all whole rices, but with a differently-pigmented outer layer. Any type of rice, , may be eaten whole. Whole rice has a mild, nutty flavor, and is chewier and more nutritious than white rice. A thiamine-deficient diet including only white rice can cause beriberi; the disease can be prevented, and treated, by eating whole rice instead. Rice plants accumulate arsenic, and there have been concerns over excessive arsenic levels in rice. There is more arsenic in the bran, so brown rice contains more arsenic. The European Union has introduced regulations on arsenic in rice, but the United States has not. 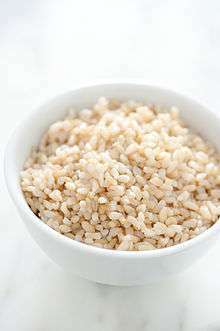 Brown rice and white rice have similar amounts of calories and carbohydrates. White rice, unlike brown rice, has the bran and germ removed; and has different nutritional content. 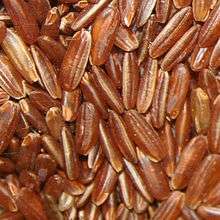 Brown rice is a whole grain and a good source of magnesium, phosphorus, selenium, thiamine, niacin, vitamin B6, an excellent source of manganese and high in fiber. Several vitamins and dietary minerals are lost in this removal and the subsequent polishing process. A part of these missing nutrients, such as vitamins B1 and B3, and iron are sometimes added back into the white rice. In the US the result is called "enriched rice", and must comply with Food and Drug Administration (FDA) regulations for this name to be used. One mineral not added back into white rice is magnesium; one cup (195 g) of cooked long grain brown rice contains 84 mg of magnesium, while one cup of white rice contains 19 mg. When the bran layer is removed to make white rice, the oil in the bran is also removed. Among other nutrients lost are dietary fiber and small amounts of fatty acids. It has been found that germinated grains in general have nutritional advantages. 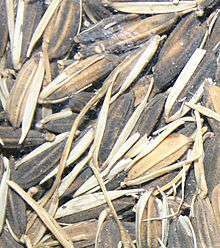 Germinated brown rice (GBR), developed during the International Year of Rice, is brown rice that has been soaked for 4–20 hours in warm 40 °C (104 °F) water before cooking. This stimulates germination, which activates various enzymes in the rice, giving rise to a more complete amino acid profile, including GABA. Cooked brown rice tends to be chewy; cooked GBR is softer, and preferred particularly by children. Brown rice generally needs longer cooking times than white rice, unless it is broken or flourblasted (which perforates the bran without removing it). Parboiled rice is a modified process that forces into the kernel some of the vitamins found in the hull before the hull is removed. The process provides more nutrition than white rice while shortening the time necessary for final meal preparation. Some white rices are also fortified. Brown rice has a shelf life of approximately 6 months, but hermetic storage, refrigeration or freezing can significantly extend its lifetime. Freezing, even periodically, can also help control infestations of Indian meal moths. Rice accumulates arsenic. Natural arsenic levels in groundwater and soils vary. Rice grown in some regions contains less arsenic than others. Arsenic from pesticides and poultry fertilizer may be taken up by rice. A 2012 report from the USA publication Consumer Reports found measurable levels of arsenic in nearly all of the sixty varieties of rice and rice products it tested in the USA. Consumer Reports states that brown rice has 80 percent more inorganic arsenic on average than white rice of the same type, because the arsenic tends to accumulate in the outer layers of the grain. Its 2013 analysis found that rice cereal and pasta can possess significantly more inorganic arsenic than the 2012 data showed. Consumer Reports said just one serving of rice cereal or pasta could place children over the maximum amount of rice it recommended for their weekly allotment, due to arsenic content. One study published in the Proceedings of the National Academy of Sciences (USA) journal found study found a median level of arsenic that was 56% higher in the urine of women who had eaten rice. ↑ "nutrient profile". live science. ↑ "Enriched rice". US Food and Drug Administration. Retrieved 2016-03-06. ↑ Ito, Shoichi & Ishikawa, Yukihiro (2004-02-12). "Marketing of Value-Added Rice Products in Japan: Germinated Brown Rice and Rice Bread". Retrieved 6 March 2016. ↑ "Storage". Usarice.com. Retrieved 2012-05-17. ↑ Ware, Lauren (2012-03-14). 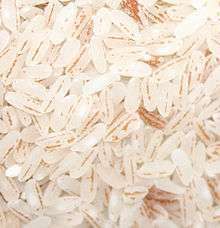 "Dartmouth Medicine — Research raises concerns about arsenic in rice". Retrieved 2015-03-27. ↑ Consumer Reports (2014-01-11). "How much arsenic is in your rice?". Retrieved 2015-03-27. ↑ Sohn, Emily (2014-10-20). "Contamination: The toxic side of rice". Retrieved 2015-03-27. ↑ Yandell, Kate (2014-10-04). "How Rice Overcomes Arsenic". Retrieved 2015-03-27. ↑ Consumer Reports (2012-11-11). "Arsenic In Your Food". Retrieved 2015-03-27. ↑ Spivey, Angela (2012-01-11). "NIH: Studies find arsenic in food adds up". Retrieved 2015-03-27. Wikimedia Commons has media related to Brown rice.